This poem is a happy way to greet the day! Hola buen día Día perfect for children learning Spanish. It is joyful and affirming. 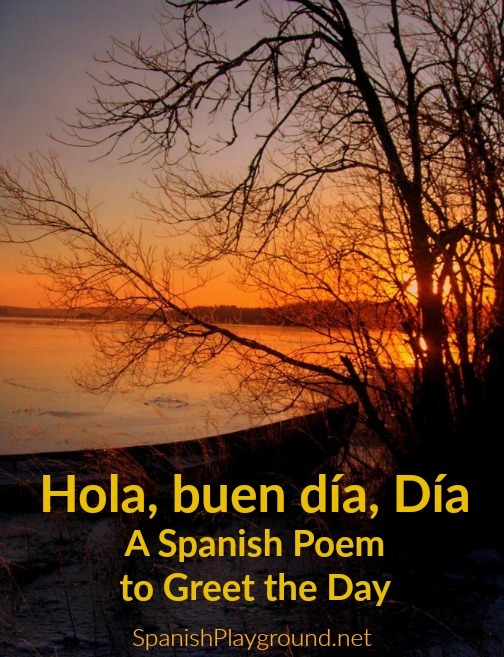 This is a short Spanish poem for kids with common vocabulary and great rhythm, and it would be an excellent choice for a class to recite to begin the day. Hola buen día Día is also a wonderful poem to read with children at home. Hola, buen día Día is by the well-known Argentine writer and illustrator Douglas Wright. He generously shares his work on his blog El jardín de Douglas and gave me permission to share it here. Douglas Wright illustrates his poetry. In addition to adding a wonderful dimension to the poems, the drawings are valuable for teaching children Spanish. Use the link to read this morning poem with the illustration. Click on the illustration to enlarge it. Below you will find suggestions for using this poem with kids. – Read the poem together. Add actions to reinforce the meaning of the words. For example, you can lift your arms like the child in the drawing when you say buen día día, wave at the sun and the sky when you say buen día to them, point at yourself when you say mi día, and hug yoursef when you say soy yo. – Beginners can use the vocabulary they know to greet people and things: Buen día, amigo; Buen día, perro; Buen día, casa; Buen día, escuela, etc. – Ask questions like these if they are appropriate for your child’s level of Spanish. The questions in parenthesis are simpler because children hear the vocabulary in the question. 3. ¿A quién más saluda el niño? [¿El niño saluda a la luna o al sol? ¿El niño saluda a la tierra (mar, árbol, nubes, etc.) o al cielo?] 4. El niño dice “esta vida es mi vida.” Se refiere a todo a su alrededor – el lugar, la ropa, los animales, las plantas. Si tú dices “esta vida es mi vida,” ¿cuáles son las cosas de que hablas? ¿Cuáles son las cosas de tu vida? ¿Qué ves aquí? ¿Y otras cosas que no ves que son parte de tu vida? 5. El niño dice “este día es mi día.” Este día es suyo para hacer lo que tiene que hacer y lo que quiere hacer. ¿Y tú? Si dices este día es mi día, ¿cuales son las cosas que vas a hacer? ¿Qué quieres hacer hoy? 6. El niño dice “este día soy yo.” ¿Quién eres tú? Somos muchas cosas, por ejemplo el nombre, la edad, como somos físicamente, la personalidad. Cuando dices “soy yo,” ¿quíen eres tú? 2. Children can draw a picture to illustrate “la vida de este día.” They can also circle things in the illustration of “esta vida es mi vida” that they are going to do that day.